Looking for a fun game for all ages that does not require batteries or complicated set up? Then RYG Wooden Ring Toss Game Set is for you. - Bring some fun and friendly competition to your backyard, camping trip or tailgate party. - This classic tossing game also helps kids and adults improve their hand-eye coordination, concentration and accuracy. - Set includes 5 durable rope rings, 5 pegs and a sturdy wood base with point markings. What are you waiting for? 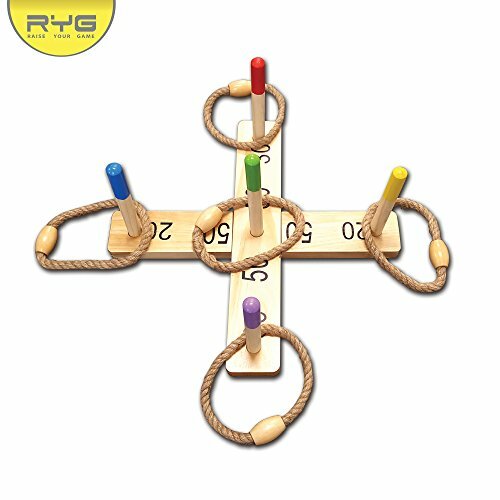 Get your own RYG Wooden Ring Toss Game Set today! ►ALL-WEATHER CONSTRUCTION◀ Great for indoor or outdoor use. Made from high quality wood to ensure ultimate durability. Includes 5 pegs with score numbers 5 rope rings. ►CONVENIENT SETUP◀ Very easy to set-up and tear-down. This wooden ring toss game is ready to use right out of the box! ►COMPACT◀ Easy to store and carry anywhere. You can bring it at a party, on vacations, picnics, camping, game nights, carnival games, and more. ►HELPS IMPROVE COORDINATION◀ Helps improve hand-eye coordination as well as concentration. A great tool for all ages to practice their accuracy and precision. ►SATISFACTION GUARANTEE◀ We are committed to provide high quality products and excellent customer service. If for any reason you are not happy with your wooden ring toss game set, get in touch with us and you get your money back - no questions asked! If you have any questions about this product by Raise Your Game, contact us by completing and submitting the form below. If you are looking for a specif part number, please include it with your message.